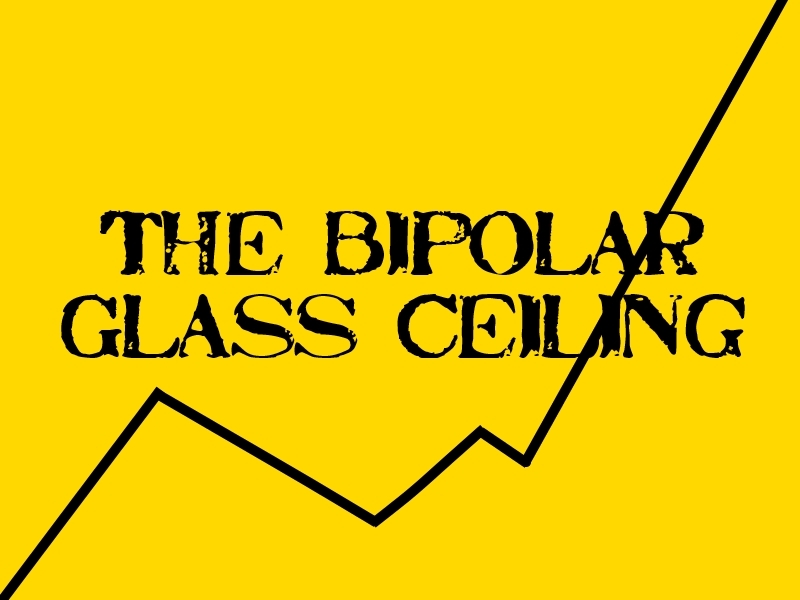 The term “glass ceiling” is usually used to describe barriers in advancement in a person’s career. Over the last few years, I’ve used this term a lot to describe barriers in my progress with bipolar disorder treatment. When I was diagnosed (incorrectly, at first, with major depression, soon after with bipolar disorder) I imagined that if I took all the right meds and went to therapy once a week, eventually I wouldn’t have bipolar disorder. I had no idea that I was going to spend the next nine or ten years unraveling a tangled black knot of lingering childhood trauma, screwed up relationships, and self-doubt. I didn’t know there was going to be so much medication trial and error, cycle after cycle of episodes, that I’d ever end up in a psychiatric hospital, or that I’d get on track and mess it up quite a few times before I started to get good at managing my brain chemistry. When I was 19, a therapist said to me, “I know people who have gone 25 years without an episode,” which sounded crazy to me at the time because my life still felt so out of control. I kept going, kept trying treatments, learned new things, applied them to my life. Things got better, and I held onto the idea that, though I’d been told my illness would never go away, eventually it would get shoved in a closet somewhere to be forgotten and gather dust. I’ve had three to four big episodes in the last two years: two manic, one or two depressed. By comparison, I spent all of high school cycling so fast my episodes were indistinguishable from each other. I cycled so much, so fast as a teenager that most of my memories of high school aren’t of classes I took or school trips or things I did with friends; my high school memories are sleeping 18 hours a day and waking up wondering whether it was day or night time, being so manic I had to pop sedatives in the girl’s bathroom so I could go to class, or skipping class altogether to drink tea all day and write because maybe if I gave my words form, then my brain would shut up for a few minutes. I became really frustrated, more recently, when I would do well for months—at work, in my relationship, in my own personal sense of happiness—and then an episode would rear its ugly head. I felt like I’d failed. Sometimes I thought obsessively about how I could be better, manage better, reorganize my life so that I was the epitome of a mental illness success story. I felt like I had to prove my success by living in an unchanged state of wellness. I’m a decade-seasoned bipolar pro, right? The realization was kind of a relief. I think sometimes I become so wrapped up in moving forward, getting better, doing more that I don’t realize that I’ve made so much progress, I am doing well, I’ve done more than I imagined I ever could! No one, mentally ill or otherwise, lives their life in an unchanging state of wellness. Progress isn’t a steady uphill line on a graph. Maybe someday in the future, I break through that glass ceiling. New treatment options. New science. New methods in psychology. Technology and medicine keep on evolving. Until then, I’m patting myself on the back for how much work I’ve put into this illness in 10 years. I’m managing day-to-day. It’s less exhausting slaying the monster episodes when show their ugly faces, and I’m getting a heck of a lot done in between. Standing still feels pretty good right now.